My Mom does not care for Halloween. My whole life I heard about where Halloween came from and we were not allowed to participate in a traditional Halloween experience. Some people say that it is cruel not to let children go trick or treating or participate Halloween. I can honestly say I was not harmed in anyway and never did I feel like I missed out on anything. One way my mom accomplished that is by offering us a ton of fun alternatives for Halloween. Things that kept us so busy that we didn’t even notice that we missed out on anything. Holidays are for spending time with family and making memories and traditions together. It doesn’t matter if you are all for Halloween or if you do not celebrate it at all. Both groups of people will have tons of fun doing some of these family activities! Host a Party – Every year on Halloween night we all gathered at the church for what was called a Hallelujah Ho-down. We were allowed to dress like country folk and dress the night away! Parents and children all dress like someone from the country. Some even came in some hilarious costumes dressed as the biggest “redneck” that you could imagine! We had food, dancing and one year even had line dancing to keep us busy late into the night. Children and parents alike will have a memory that keeps growing year after year. Host a Bomb Fire – What better way to celebrate fall them by hosting a huge bomb fire! Everyone loves a campfire on a cool autumn evening. You can offer bobbing for apples and flashlight tag as fun events for the party. Food is easy…… hot dogs and smores of course!! Autumn Craft Night – Pull together a group of friends and host an autumn craft night for the kiddos. There are plenty fall themes you can choose from when celebrating for autumn. Here are a few ideas…….. Outdoor Movie Night – I have a friend who has a projector and we always have a blast having a kids movie night at her house. The kids all decorate boxes to look like cars and they line them up just like if they were at a drive-in movie!! Popcorn is always the treat for the night and the kids have a blast! Nighttime Scavenger Hunt – Hosting a nighttime scavenger hunt is always fun. Grab a Free Fall Scavenger Hunt Printable, some flashlights, snacks and beverages and you can plan on a great night of fun! Parents can help the younger ones so they are not afraid (we don’t want anyone hurt). You can even have small prizes for everyone who hunts! Candy Treasure Hunt – Kids just love maps and treasures so what better way to host a party than by coming up with a cool pirate theme. You can even send out some cool treasure map invitations to your guests. Hop on over to the talk like a pirate translator and print off some cool saying that the guests can use throughout the night. It’s just fun taking like a pirate! Cookie Decorating Contest – Bake up some great sugar cookies and have the supplies laid out for the kids to decorate. You can even have some prizes for the best, most unique and even for the one that used the most icing!! There are a million and one alternatives for Halloween that you can choose from. 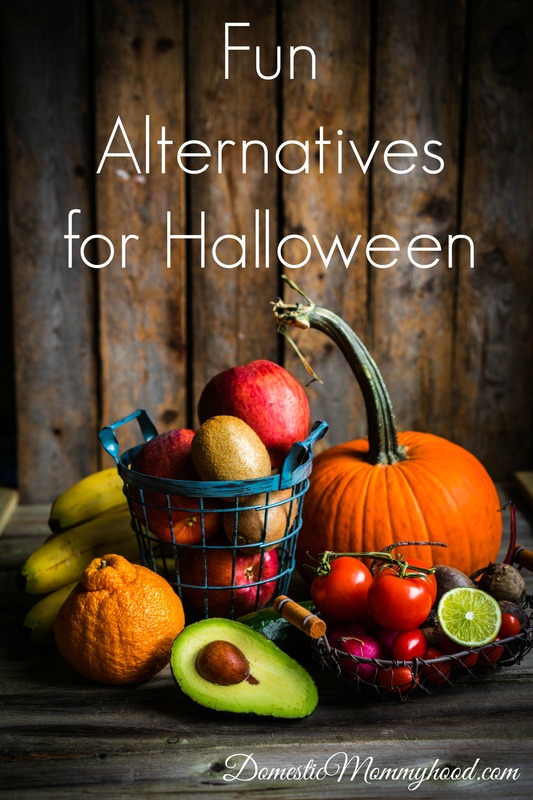 Have an idea on a fun alternative for Halloween that you would like to share!! Please send in your idea and I will get it added to the list! !